Participated, along with Trump Jr and Jared Kushner, in a meeting with Russian attorney after Trump Jr was told he could obtain damaging info on Hillary Clinton. Indicted by Grand Jury October 30th 2017 on 12 counts including conspiracy against the United States, conspiracy to launder money. Plead Not-guilty in court appearance, placed under house arrest after being declared a flight risk. Indicting Manafort and two others is the first major step in Robert Mueller’s investigation into the Trump campaign’s possible collusion with Russia. 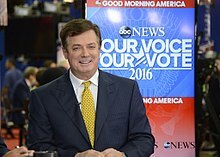 Keeping this in mind, it would be unlikely that Mueller would pursue charges against Manafort unless 1) he has a high level of confidence that these charges can be prosecuted successfully and 2) Mueller is somehow connected to the actual impetus of the investigation, which is Trump campaign collusion with Russia. In response to the Manafort indictment, Sarah Huckabee Sanders said from the White House Briefing room that the charges brought against Manafort, Gates, and Papadapoulos have nothing to do with the president, but the only reason Mueller is in charge of the investigation is because Attorney General Jeff Sessions recused himself from the case because of possible conflict of interest. The case involved possible Trump campaign collusion with Russia, and he was Trumps AG. Trump himself has said openly that if he knew Sessions would recuse himself from the case, he probably wouldn’t have even hired him as AG. So Mueller is not going to take over a case regarding possible collusion of this administration with the Russian government and then pursue ancillary, tangential charges as an end in themselves, they are merely a means to an end. If Manafort, Gates, and Papadopoulos are being indicted at all, it’s because their indictment and possible prosecution are an means to an end, not an end goal themselves. All experts and followers of this case agree that this is likely to connect closer to Trump in the next steps forward, but it is only conjecture at this point whether it will eventually involve Trump himself.